Some of my favorite objects are the baby items from the EA Store, created for Apartment Life. But the original objects work as cribs as well, and babies will fall asleep when they go below 50% energy. In a baby-discussion over at MTS, one of my favorite creators, iCad, mentioned not using them because of the sleeping ruining the sleep schedules she set for her babies. I've long wanted to create something for her, and I agree that they'd be better without the sleep. After some poking and prodding I figured out how to make that happen. I offer you, the baby bounce chair and the baby dangle monster, with sleep disabled. The files are large because of the sounds these objects have. I'm sorry about that, but I imagine most people want the sound. Thanks Leefish for helping me check! UPDATE! Now with functional sound on the baby bounce, courtesy of gayars who was kind enough to update them for me. Thank a ton gayars, you're the best! If you had downloaded these in the past and you want animal sounds to play when the baby pushes the buttons on the baby bounce, please re-download to get the fixed files. Thanks rawmilk905 for pointing out long ago that EA borked the sound. There are many versions of these objects available out there, but I have edited the two versions I use the most. Version 1. Less Bladder Tantrum by RebaLynn1960 here on Leefish, found here. This is just like the original objects offered in Store, but babies require lower bladder need to start throwing a tantrum about it. Note! Guid has not been changed, so you can only use my no sleep version, or RebaLynns regular version. Version 2. Slaved to crib bedding, by Theraven at Moonlight dragon, found here and here. A great big thanks to Theraven for creating this version, and giving me permission to modify it. Note! These require the original baby bounce and dangle monster. The less tantrum version above counts as original, so you can use that one, or RebaLynns sleep-allowing version. I'm afraid I don't know any place with an unmodified original, but if anyone does I'd be happy to include a link. NOTE 2! Guid has not been changed, so you can only use my no-sleep version, or Theravens sleep-allowing version. If anyone has any other versions you'd like sleep removed from, you're welcome to send me a PM over at MTS. Just make sure the policy allows editing! Credits to EA for creating the objects, and RebaLynn1960 and Theraven for their modified versions. Thank you! Policy: Because these are based on other peoples work as well as mine, I ask you to contact me before using it for a project of yours. Send me a PM on MTS. Oooh thank you. This is very useful. 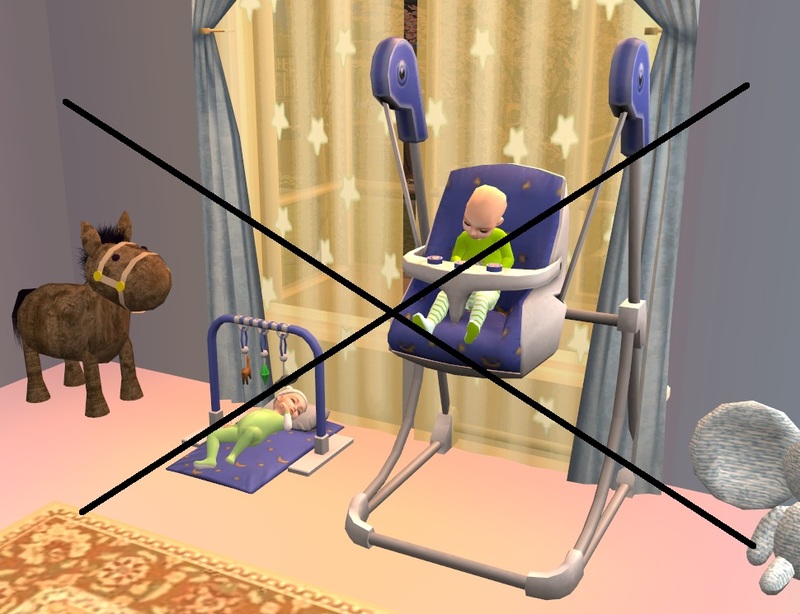 These objects have adorable animations, but most of the time the babies just sleep instead of playing. Now we can actually watch them play instead of sleep! Great idea! This will be very useful, especially for the Sim parents who'd like their littlest Simlets to be able both to play in the bounce chair and sleep at night. Thanks for sharing!